Our hearts are blooming with flowers and trees. Our feelings are awakened and ready to fly. Is it summer again? The eternal, never fading summer of our spirit! I sometimes ask myself what is so enchanting about Summer Shows. They are usually very short and depend on capricious weather conditions. They are scattered over great areas and involve additional hassle with installing your own tent. Yet, they are absolutely marvelous! The answer is simple: Summer Shows are all OUTDOORS which means beautiful parks, abundant music, and dynamic entertainment. I opened my Summer Outdoor Season 2016 with three very different and exciting shows. Artfest Port Credit Show in Mississauga welcomed me with sunny, hot weather. “Sometime too hot the eye of heaven shines…” To my delight, I sold out all my new Summer Dresses at this very first show! And honestly, I can understand why - I myself could not resist wearing my Summer Dress during those hot days. My second outdoor show of the season was in Windsor. The highlight of this show is a performance of the Diplomats Drum and Bugle Corps. 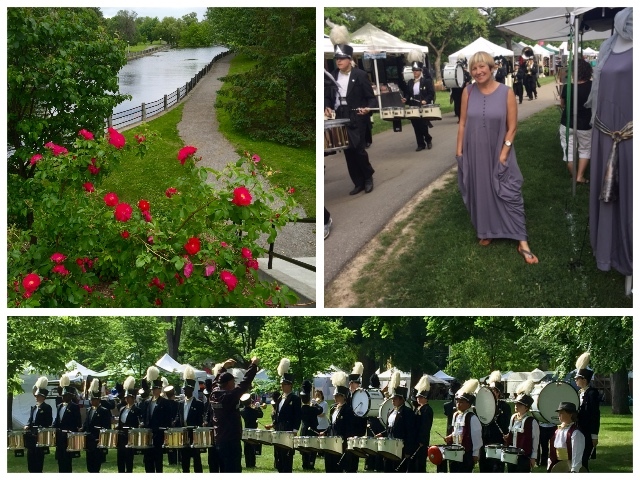 Elegantly uniformed young boys and girls march throughout the park playing drums and bugles. This parade of youth, energy, and joy vibrates in the air even when the last musician disappears from the sight. Of course, this is not the only attraction of the Art in the Park show. My third opening show was in Ottawa - our beautiful capital. Mother Nature demonstrated her temper on the weekend of the New Art Festival. We had the sun, and then the rain, and then the sun again. But the vagaries of the weather only added beauty to the world.